Yesterday we reported about leaked images of a device called the Moto C. Now we have the technical specifications of the Moto C and a slightly better version, called the Moto C Plus, thanks to Evan Blass. The leaked specs reveal entry level Phones, with hardware which could target first time smartphone users. 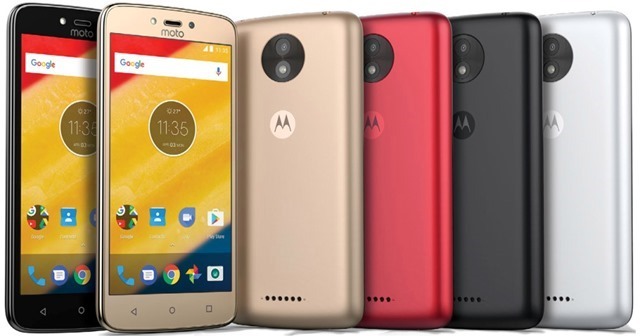 The Moto C which will come in 3G and 4G variants has a FWGA 850 x 480 resolution display, and is powered by a 1.3GHz 32-bit quad core MediaTek processor with 1GB/2GB of RAM. The 4G variant has a 64-bit chipset clocked at 1.1GHz. The device will come with 8GB/16GB of storage and an expandable memory card slot. The Moto C is backed by a 2,350 mAh battery. Photography wise, the Moto C will come with a 5 megapixel rear camera with autoFocus being exclusive to the 4G variant, and a 2 megapixel front camera with a selfie flash. The Moto C Plus sports a 5 inch 720p HD display, and houses a 64-bit MediaTek quad-core SoC of the same clock rate, and 16GB of internal storage. It will support MicroSD cards, and packs a massive 4000mAh battery. The Moto C Plus has a front camera similar to the C, but the Plus has an 8 megapixel rear camera.The Moto C and Moto C Plus will be available in 4 colours: Black, white, gold, and red. This does appears to be a Lenovo device, than a Motorola one, but at least you will get the near stock Android experience.